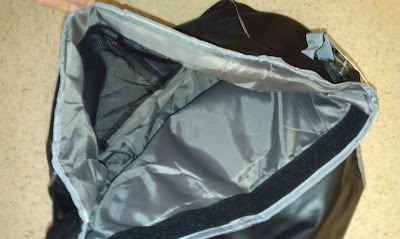 Do you find yourself carrying a massive see through box into transition with all your triathlon gear, some stuff you always use some stuff you never use. Do you try and balance it on your handle bars while pushing your bike and keeping it all balanced.. one small move and it all crashed on the floor.. well I know I've been there so I was looking for something to make that journey to transition that little bit easier! 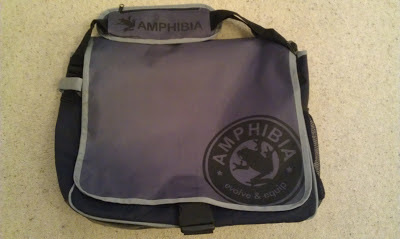 Look no further, I have the answer and it comes in the shape of the Amphibia X-Bag! A very nice gentleman at Amphibia Sport sent me one of there X Bags to try out and I can only complement this piece of kit. First impressions are how good this bag looks, it is an attractive looking messenger bag, it comes in 2 colours and both have a lovely finish. As soon as you put it over your shoulder, its a cracking fit, there is no uncomfortable-ness on the strap as it has a strap protect so you can move it to fit your size, this also included the length of the strapping so it can cater for tall and short people. 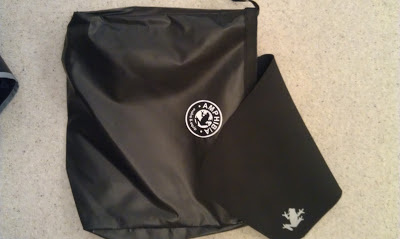 When you pick the bag up you know its built well, its built to last, not just one season too. I have used it this triathlon season and now I'm using it as a hold all when I'm away with work too. 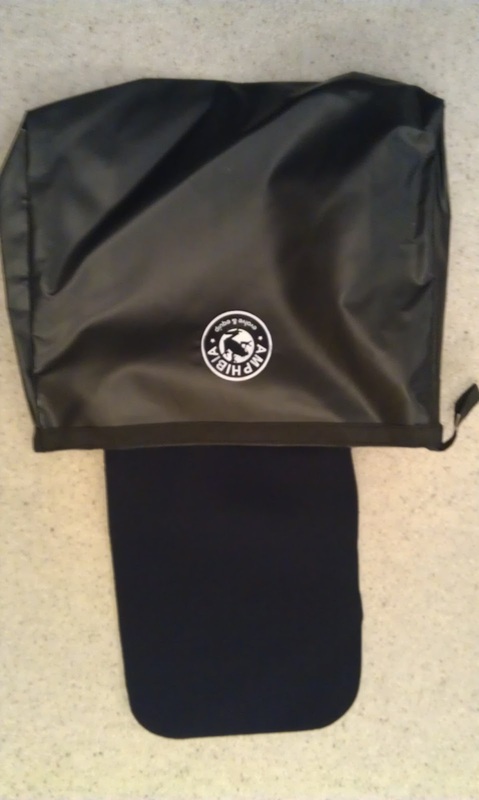 The water proofing on the bag is excellent as you know the UK weather is wet nearly all 12 months of the year so its a must that your kit stays dry and the handy clip work in two ways. The first is to keep the bag closed so nothing falls out when your on the go and the second, is to keep the bag open in transition. Which is brilliant, no fiddling with the bag in transition for you kit as the bag is open ready, with dry kit for you to make your transition slick and smooth. The bag has plenty of space inside so people who like to pack everything including the kitchen sink, there is room to accommodate. 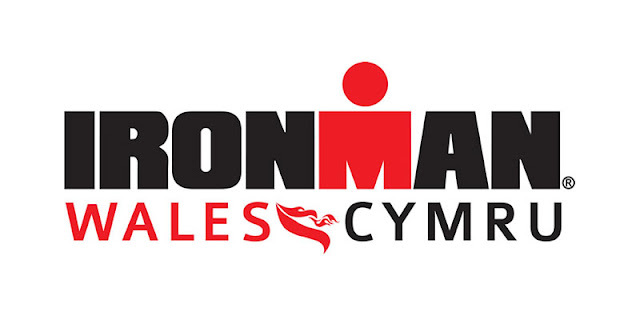 It is also helped me cut down the amount of kit I need for transition, which give me less to tamper with pre race so I can get focused for the days racing. Inside the bag in the genius part, there is a waterproof section for your wet suit post race, and this saves all your other gear getting soaked through, you can keep this area/bag in the main hold all or you have the option to remove it. Its simple Velcro-ed in place. The second part of the genius inside the bag is the transition mat, I know I always end up with stones inside my shoes which is quite uncomfortable for the bike and for the run so the change mate helps limit the chances of picking up gravel in transition and lets you wipe and dry your feet in a comfortable environment. These photos show the wetsuit and transition mat removed from the main X Bag, its really easy to add and remove the internal bag and mat. The external of the transition bag, has a large netting panel which you can store your race hydration in, I managed to get 2 race bike bottles in no trouble and my other bottle was stored on my bike. No worries about forgetting my race hydration there. 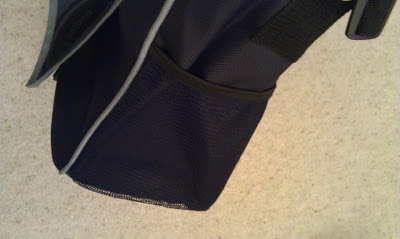 The other end of the bag is another amazing idea, its a Velcro setup which lets you store your helmet on. The amount of people I've seen struggling into transition, and end up dropping there helmets by showing stewards there kit numbers is huge so this simple idea on the side of the Amphibia bag is amazing. Now down the last bit of storage for the Amphibia X-Bag is a nice little finish, as most triathlons are early morning races on the weekends, I have set my alarm 5am, slipped out of bed and left the family fast asleep when I go off to race. I take my car and I have no one to leave my car keys with, well they have even though of that in the X-Bag. 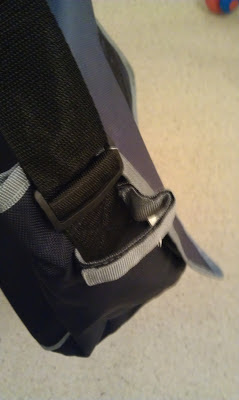 The shoulder strap has a compartment for your keys or other belongings that you want to keep safe. It has has small and sleek storage compartment which will keep your items dry and safe while your off racing. All I can say is great things about this bag, If your looking for a bag to replace your massive transition box, which has stuff you will never need in, and will keep your kit dry and safe on race day then look no further. 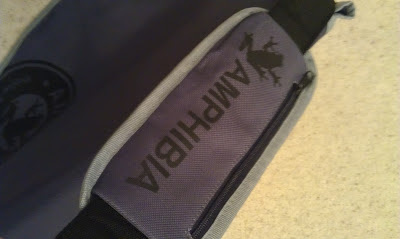 The Amphibia team can even customise logos on the bag for clubs and races so its definitely worth a look. Thanks Adrian and good luck with the future of Amphibia, its a cracking product line so you have nothing to worry about! Its well worth the investment mate its a cracking bag and covers all bases for race day.